There are many times a day where I turn a corner in my house or run into a room at the sound of mayhem, and ask myself: “What is wrong with this picture? ?” Is it the hair-pulling and biting? Or maybe the bucket of toys thrown down the stairs in a shower of cheap plastic? Or the dog wearing the feather-trimmed dress-up outfit? Within 30 seconds I can mentally point out a minimum of 5 things that don’t belong in the scene that I’m viewing. 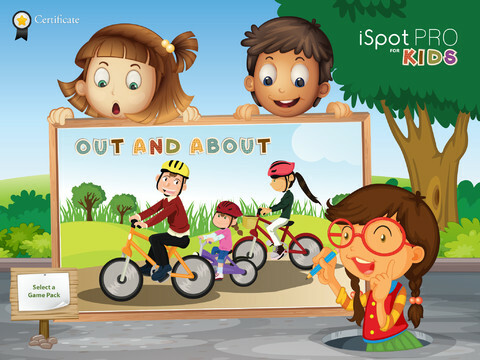 This spot-the-difference fun is the premise of iSpotPro Kids, a newly released app that uses everyday scenes as the backdrop to help kids choose the details that don’t match in a series of two similar pictures. Playing the game is as basic as spotting a difference and tapping the area on the picture, which means that young players and kiddos with special needs or learning disabilities will be able to easily play. Over the course of 7 “play packs” for a total of 35 levels, players compare a picture on the left with one on the right, trying to find the dissimilarities. It could be the varying colors of a child’s shirt, the absence of a bell tower, or an extra cow on the barn. 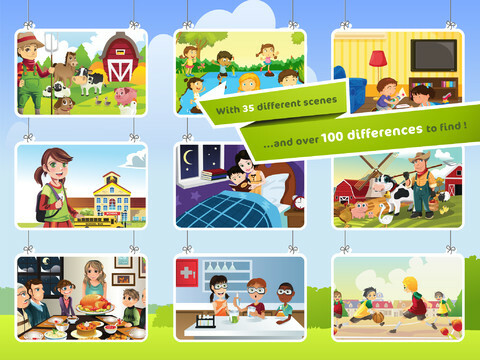 Because the pictures depict real-life scenarios (school classroom, playground, bedroom at bed time) children can easily relate and won’t get overwhelmed with the task at hand. 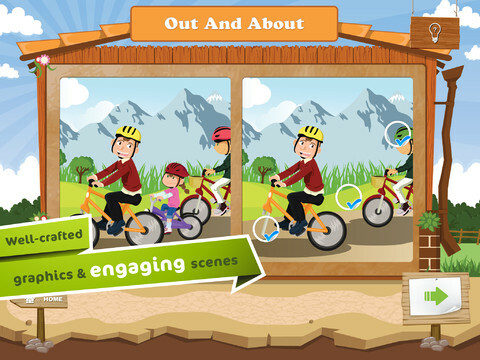 Each level only has 3 differences, which also helps to keep kids interested and encouraged. Both kids caught the hang of the game pretty quickly and enjoyed finding the differences. The only downside was that there was no music or sound effects; while some games have very distracting soundtracks, this particular app could have benefited from some noise. Overall the app was a winner in our house, and $1.99 it’s a reasonable price for an entertaining app. Note: Developers added a soundtrack to the app on January 30 during an update but we aren’t changing the review or rating. The tune is a simple, music-box style song with subtle effects for wrong and right answers and enhances game play by keeping children interested without distracting them from the pictures. – Was originally no audio, however a recent update has fixed this issue. No reading required to play this game, which means readers and non-readers alike will enjoy it!